To edit protocol handlers in your Google chrome browser, just paste chrome://settings/handlers in your address bar and hit enter. By default, you’ll notice empty page with no active handler. This means that when you click on Mailto: links it does nothing. 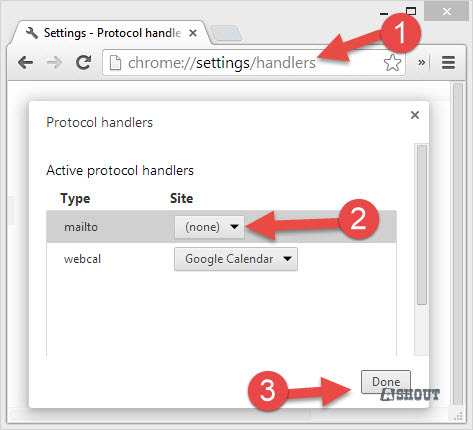 To Set default protocol handler in your chrome browser, visit any web app or website which support protocol handlers (For ex: Gmail for mailto:, Google Calendar for webcal: ) and you’ll see Protocol handler icon <<>> onright side of your address bar, click that icon to set default handler. For example purpose, I will show how to set Gmail.com website to handle all mailto: links on your chrome browser. Allow Gmail (mail.google.com) to open all email links? Here you choose “Use Gmail” option to open all your email links or mailto: links in Gmail website and click Done button. 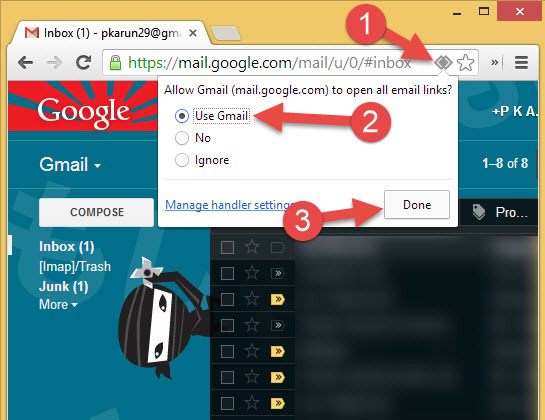 From now onwards all your mailto links on your Google chrome browser will open Gmail website to send emails. Didn’t get Protocol Handler icon <<>> on your browser? If you didn’t see any <<>> protocol handler icon on Gmail or any website, then there are the few reasons why it won’t show. 1. 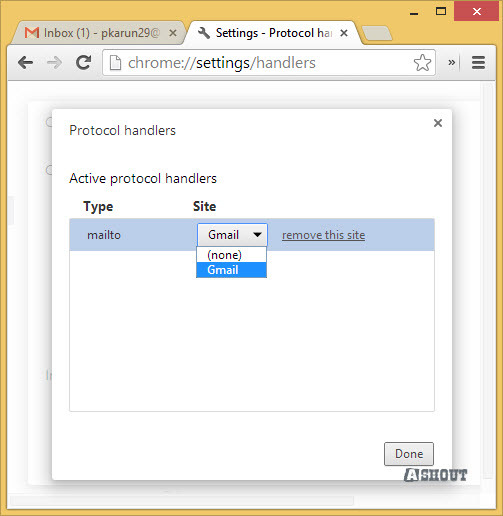 You have already set this Protocol handlers entry on your chrome browser. 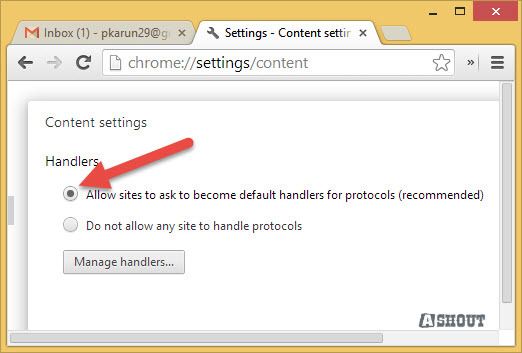 To check this, copy and paste chrome://settings/handlers this in your chrome address bar and hit enter. Select the first option to get a suggestion. 3. The site or web app won’t support handlers. If you wish to change one protocol handler to another, then visit chrome://settings/handlers and choose the protocol handlers from the drop-down menu and click Done button. I have explained how to set Gmail.com website to handle mailto: links. You can follow the same method to set any other website as default protocol handlers. But what if, if you need to set software has a default protocols handler? you cannot follow the above guide to achieve it. For example, If I need to set my Mozilla Thunderbird application has my default mailto: link protocol handler, then above method won’t work. That is, every mailto: link found on Google Chrome browser should open in my Thunderbird software. You can follow this method to set other software has default protocol handler as well. 1. Open your Chrome browser, inaddress bar enter chrome://settings/handlers and open it. 2. Here in Type look for mailto and set Site to (none) option and click Done. 4. Here you choose Thunderbird from the application list. 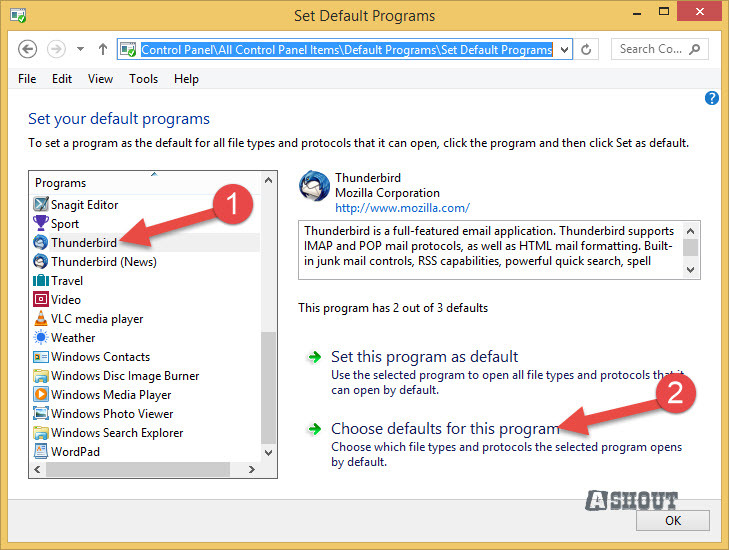 And in the right side choose, Choose defaults for this program option. 5. In this window have a look on MAILTO option which comes under Protocols, and Check MAILTO check box and click Save and OK button. That’s it. Now all mailto links on your chrome browser will open on Thunderbird application. Thanks for a tip that worked. I searched a lot for a guide like this. At last I remembered to restrict the Google search to only include hits from the last month. Is your email account maybe managed through someone other than gmail? I ran into the same thing – no <> icon, no handlers available. It’s a gmail account, but it’s managed through my work and has a different domain. I’m guessing they disabled the option to manage handlers on some higher level. Good solution, presented well. Thanks!! OMG. Thank you so much. The mail.to not working has been bugging me for ages and I just couldn’t figure it out. Your first suggestion worked for me …but it’s great that you have included lots of alternative fixes. I’m looking to change the protocol handler for click-to-call. The user on the computer choose “do nothing” and “remember my preference” when clicking a phone number with SIP. Now there is no prompt to allow a difference choice. I also have no handlers listed in the settings for Chrome. Any idea how to reset this preference? I had this recently, after Skype took over for callto URLs. First, I did the step that he shows for Thunderbird in the Default Programs control panel, where I told Windows that my phone app should handle callto URLs. Then I ended up just deleting the Chrome profile for that user (C:\Users\UserName\AppData\Local\Google) to clear the “don’t ask again” checkbox. After that, it brought back up that “attempting to launch external application” box again so that I could hit the checkbox and click launch application. Thanks, Mike. I’m having the same issue, trying to change tel and callto URLs. I set the default protocol, and it works with the MS Edge browser. Chrome, however, keeps trying to launch Google Hangouts. How did you delete the profile? I deleted the entire Google folder but could not generate the “don’t ask again” message you describe. Email links, incidentally, still work fine with Outlook as the external app. Thank you Arun! Solved within 2mins.. you’re a star. Thanks. I did not know anything about handlers, until I read this. Great tutorial. It doesn’t work anything of that in my case. I want to call with Skype for business when a phone number is shown in Chrome browser but by default and I cannot change it, clicking the phone number in Chrome opens Hangouts (even with the session closed). I also have configured call protocol to Skype for business in Windows. Could anyone help me please. Hi Arun, am still having the problem of not seeing the protocol handler icon in my address bar. I tried clearing my cache and restarting the browser as suggested by other sites bit to no help. Try reinstalling browser sometimes it works. Thanks very much. I checked a dozen help sites first, none of which solved the problem. Your did–and easily, too!